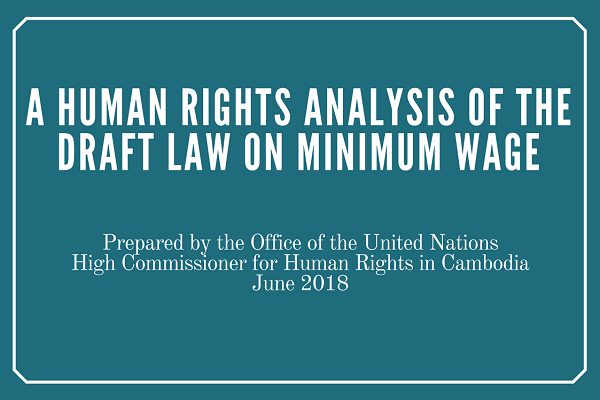 PHNOM PENH (22 August 2018) - OHCHR has released its human rights analysis of the Law on Minimum Wage in English and Khmer. The present analysis was prepared by the Office of the United Nations High Commissioner for Human Rights (OHCHR) in Cambodia while the law was still in a draft stage. It provides an analysis of its compliance with international human rights standards. OHCHR offers it as the law holds direct implications in the ability of people to fully exercise their rights to freedom of opinion, expression, assembly and association, as well as their right to just and favourable conditions of work.